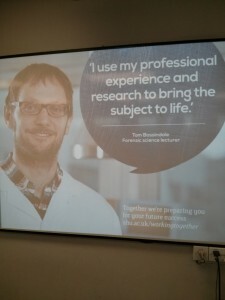 Any of you who have been on campus at Sheffield Hallam University recently may have noticed lots of pictures of a slightly hairy man watching you: that is me! Sheffield Hallam University (SHU) has recently started a campaign to show the added advantages of being one of our students, such as work placement opportunities and staff with experience from the ‘real world’ of their subjects. It was on this strand I was asked to share my career before I arrived at SHU and how I believe that may be of benefit to our students. The photo is being used on all the plasma screens around the University, as well as on screensavers and the University blackboard site (Shuspace). 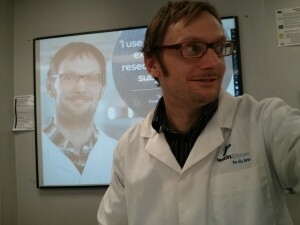 Students have said it makes them work harder in the library as they can see me watching them! I was in the lab with our second year forensic science students this week and I kept appearing behind me, which prompted me to take a Barack Obama style ‘selfie’ shown below. Enjoy! OMG Dr B is watching you!!!!! Ha ha! Love the selfie too. i’ve been graduated in Bsc forensic science in 2013 and still could not found way to get job into this field. although i have lower division grade i have keen interest working in this filed . i dont know wt to do now ? could you please guide me something? without experience i can’t go into this field and nobody giving me opportunity to gain experince.